When it comes to startups, it seems that consumer services get all the attention, while the enterprise plays get the revenue. Or so Qonto hopes as they target business customers for their new direct bank opening in second quarter. The Paris-based startup (with an .eu web address) is targeting business with their more intensive expense-tracking needs and promises “easy business banking,” a compelling slogan. The startup is not technically a bank, chartered under the French payments company regulations, but it offers debit cards, current accounts, and international transfers. The only big thing missing are commercial loans, and no doubt those are on the product roadmap, once they get some traction on the expense management side. Qonto is currently concentrating on the front-end customer experience, off loading the nuts and bolts of payments to Treezor, a French white-label payments provider. Treezor is able to provide instant MasterCard numbers to Qonto customers, with the plastic arriving within 5 days. That helps get the new business customer onboarded immediately, a great first impression. A few Finovate alums are pursuing this market, but none in France. The company was in the news last week with their first fundraising, snagging $1.7 million from Alven Capital and Peter Thiel’s Valar Ventures, which also invested in N26 and TransferWise. Bottom line: Supplying businesses, even smaller ones, is a lucrative proposition. They are not as price sensitive as they appear, because few owners have the time or patience to shop for banking services. Once they settle on a provider, you have a good chance of keeping them for the life of their business, IF you can meet their needs as they grow, especially credit. And startups are uniquely positioned to appeal to small business customers, because as a small biz themselves, they understand the customer like no large bank can. One of the most frustrating aspects of modern day borrowing, especially in the heavily securitized U.S. home loan market, is the price you pay for not being “normal.” I faced this for more than two decades as a business owner. Even with a 20-year track record in business and great personal credit scores, without that regular paycheck and W-2 documentation, it was maddeningly hard to get a new mortgage, refi, or even a car loan or credit card sometimes. But having worked on the other side, I understand that certain groups, such as small business owners, pose higher risk. So it’s understandable that underwriting, pricing, and documentation requirements for new customers are more onerous. The extra paperwork may be frustrating, but business owners understand risk vs. return, and can come to terms with it. However, there is another situation that makes customers pull out their hair, rant on social media, and tell their friends to avoid that bank. It’s when you’ve been a customer for years, even decades, but your lender decides you should be in a higher-risk group, even though you’ve done nothing risky. There is a classic example of this in the Wall Street Journal today. It tells the tale of a Seattle couple who are renting a cottage behind their primary residence in a completely legal and transparent way. And when they mentioned this seemingly great $30,000 improvement to their income in a home-equity loan-refi app, their bank, one of the largest in the United States, promptly turned them away saying it didn’t offer home-equity loans on properties with home-based businesses. Certainly, the bank can make the business decision not to lend to any category where it doesn’t like the overall risk vs. return. But their underwriting should be flexible enough to look at an existing loan that’s in good standing, and realize that if the borrower is pulling in an extra $30,000 from AirBnB, the default risk on that loan has been lowered. The bank isn’t commenting on this particular loan application, so we don’t know if there are other extenuating circumstances. Perhaps the couple had a debt go into collection or other credit problems. But since I’ve personally run into similar problems while maintaining excellent credit, I believe the couple’s story is probably accurate. Bottom line: One bank’s loss is often another’s gain. This story had a happy ending as the couple was able to refinance through super community bank Umpqua. Now that its win has been immortalized by the national press, expect Umpqua to feature this story throughout its market. We are huge fans of strategic investing by financial institutions, especially in lower dollar amounts, what we call strategic seed investing. It’s the ultimate win-win in business. NewCo gets capital, credibility and adult supervision on the board. OldCo gets inside access to experiment after experiment in its core market without risk of sullying its billion-dollar brand. That’s why we’ve seen a dramatic rise in venture investing by large financial institutions in the past 18 to 24 months. The best place to find new strategic investments? Our quarterly Finovate events around the globe (of course). But to help you narrow down the possibilities from our 857 alums, we try to highlight promising areas here from time to time. Today, we look at risk-evaluation services targeted to small- and mid-sized businesses (SMB), also known as business credit scores. Given the massive businesses built on the back of consumer credit scoring—Experian, Equifax, TransUnion, Credit Karma, Intersections, and all the mid-size credit score retailers—it comes as no surprise that these same players, along with a few startups, are targeting SMBs. Cortera: The company appeared at Finovate in May 2010 (FS10 video). Ten months later, it landed $50 million in private equity funding for a total of $60.7 million raised. Earlier this year, the company picked up an additional round of growth debt, but the amount was not disclosed. Two strategic FI investors were involved in its 2008 $8 million Series A: CIBC and Fidelity. Dun & Bradstreet: The company that created the industry sells reports from $60 to $150 each or $188 annually per company tracked. Experian provides a number of business credit evaluation reports in the $40 to $50 price range each or on subscription basis for $150 annually (per company followed). Equifax provides similar information for $100+ per report, or $20 per month per company tracked. Since Cortera does not appear to be in fundraising mode, and the big three are all major companies, banks should look at newer players. One that seems promising, and is currently raising $12 million (at a $65 million valuation), is Nav (formerly Creditera). Nav is geared to SMB owners for monitoring their own company. It is not currently offering services for evaluation of other companies, the bread-and-butter of D&B and others. Nav’s service combines personal and business credit scores, essential for small-to-medium businesses, for $30 to $50/mo. It’s a single source to get reports across five sources—D&B, Experian, Equifax, Transunion, and FICO. The company also offers a freemium option, with free access to summary data from two sources free of charge and obligation (with no credit card required). Nav also runs a commercial lending marketplace where owners can look for business credit cards, loans and other financing from Nav-affiliated lenders. San Mateo, California-based Nav was founded in 2012 and raised a $6.5-million Series A led by Kleiner Perkins in Nov 2014. The company was founded by Levi King, who previously co-founded alt-lender and 2011 Finovate alum Lendio. Business owners are optimists. It’s a job requirement. So whether or not a small business is currently seeking capital, most hope to grow down the road, so the POTENTIAL to tap more funding is a huge factor when selecting a bank. It’s why small businesses have long sought to establish quality relationships with community banks or larger FIs. But in the aftermath of the 2008-to-2012 downturn and all the negative press about the “credit crunch” (both real and imagined), business owners are less confident that their bank will come through for them when they need it. That’s why banks should offer credit to ALL small- and micro-business customers. It doesn’t have to be a large amount, or free of fees, or at an APR that would make the CFPB happy (it’s commercial credit we are talking about). FIs just need to demonstrate they have their client’s back. Along the same lines, most banks could do better providing peace of mind. The most important factors are transaction/payment reliability, service quality and, probably most important these days, security. Again, it’s about the peace of mind knowing that your bank will run your account flawlessly while keeping thieves at bay. And failing that, reimburse the losses without a business disruption. These things cost money. But the good news is that businesses understand that and will pay for it. Most growing businesses are price-insensitive when it comes to their transactional bank account. It’s just not a material expense, especially if you factor switching costs. In fact, I have long stated that I’d be happy to pay $500/mo for a business banking account with my ideal mix of banking, security and accounting services. Two Finovate alums partnered today to make it easier for small and medium businesses to conduct business abroad. Xero’s small business users based in the U.S. and U.K. can use the TransferWise add-on to pay invoices in 25 currencies to 46 countries. After the payment arrives, the invoice is reconciled on Xero. New Zealand-based Xero most recently presented at FinDEVr 2014 in San Francisco. The company launched its Business Identification product at FinovateSpring 2011. London-based TransferWise demonstrated at FinovateEurope 2013 in London. CAN Capital provides loans and merchant cash-advances to small- and medium-sized businesses. Since launching in 1998, the company has extended a total of 150,000 finance transactions to small businesses, providing access to $5 billion. The New York-based company is best known for its Daily Remittance Platform. The underwriting technology evaluates business risk based on recent performance, which generally enables it to approve financing for more businesses. CAN Capital debuted its Mobile Funder on the FinovateFall 2013 stage in New York. We have changed banks only once in our 20-year history, moving to Washington Mutual (now Chase) in 2007 in order to get a better line of credit (which ironically, was never granted, as WaMu was about to go into a death spiral). We’ve been happy with Chase for the most part, and now have so many services and payees connected to it, that I can’t imagine going through the headache of changing. Even if another bank or CU offered a fee-free account that matched Chase feature for feature, it’s just not worth the considerable investment in time and energy to switch. But a few minutes later I changed my mind. Yes, there is one thing that would make me move my entire business account. And it’s so basic that it seems ridiculous that I’d even have to ask for it. Chase has state-of-the-art security as far as I can tell (e.g., two-factor authentication for all the risky moves). And we’ve never had a problem. However, every time I read about some nonprofit or small business having their account drained after a successful key-logging attack, I get that queasy feeling. And I’m not even asking for the fraud guarantee to be free. I’d be more than willing to pay for it. How about $25/month for the first $100,000 covered, then $10 to $15 per $100,000 thereafter? That should be enough to make it a decent profit center for the bank and I could sleep better (note 1). A win-win. 1. Two years ago, I was encouraged by the new offering from EFTGuard (see post). They were offering coverage of $100,000 per account up to $500,000 total per customer. Insured customers were required to use fraud-monitoring software from Trusteer, Iron Key or Webroot. The price was $25/mo to the end-user with $10 of that pocketed by the bank distribution partner. But I haven’t run across any banks currently offering it. There is no other issue that ignites our passion like the lack of attention paid to small- and micro-businesses by many mainstream banks. With more than 20-million small businesses, 1 in 5 U.S. households owns a small business. And that doesn’t even count all the independent sales reps and part-time contractors that need help managing their more complicated finances. There are many reasons why the smallest businesses continue to fly under the radar: smaller balances, more complex needs, widely varying expertise, challenging underwriting issues and so on. Traditionally, this segment has been difficult to serve cost-effectively. But with technology readily available to monitor daily financial performance, respond to service requests via email, outsource credit via crowdfunding and alt-lending (see note 1), and customize online banking services, the “it’s too expensive” excuse is less and less believable. That said, it’s not easy determining how best to serve the varying needs of the elusive microbusiness segment. In this report, our sixth deep-dive (see note 2) into serving small biz online (and now mobile too), we outline what to look for and how best to get started. 1. Crowdfunding/P2P lending may well be an area that finally begins to impact traditional banking revenues. But that’s still a ways away. See our May 2013 report for more info (subscription). 2. Buyers of this report will also receive a free copy of our previous Small Business Report (OBR 172/173) published in 2009. It contains additional material still valid for today’s strategists and small-biz product managers. To continue our look at outstanding lending UI’s (previous post), I present to you Zazma. The startup, which came out of stealth yesterday, has raised $10 million to finance small loans of $300 to $5,000 for up to 60 days. The initial funding came from Sequoia and Spark Capital. This is a business that almost no bank wants, which makes it ripe for startups. But it can be lucrative. Because the business borrowers are using the money to buy needed equipment or inventory, they are much less focused on the interest rate, if they believe the cash advanced will earn them a profit. It’s the secret sauce of successful startups Kabbage, Capital Access Network and On Deck Capital (note 1). 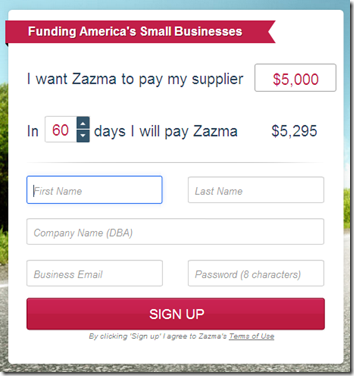 As you can see from the screenshot below, the maximum loan, $5,000 for 60 days, earns Zazma a healthy $295 fee. Assuming it’s paid back, that a 6% return over two months or an annual APR of 36%. While that’s not enough of a return on VC funds, once the company has enough of a track record to attract debt funding, that could be a sustainable revenue model. 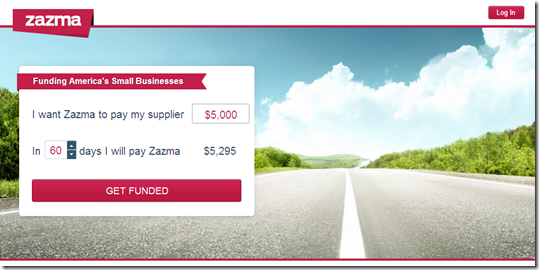 The company hopes to attract sellers who will offer Zazma-powered financing to their customers. That could be a real win-win. And because each transaction can potentially satisfy two businesses, it’s a model that bank’s should consider. While the business model is very promising, what I really love is their UI. Absolutely simple, with fewer words than Google’s famously simplistic design. Potential borrowers type the loan amount, choose the payback date and press the large, red Get Funded bar. The applet automatically shows the amount that must be repaid. It’s a fantastic start to the borrowing experience, which I have not tested. Because this is business credit, they can avoid talking about the interest rate. But there is nothing hidden here. It is a model of simplicity and transparency. 1. Follow these Finovate alums at our Finovate blog. 2. 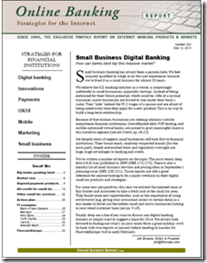 For more on small business services, including credit, see our Online Banking Report on micro and small businesses (subscription, published Oct 2009).